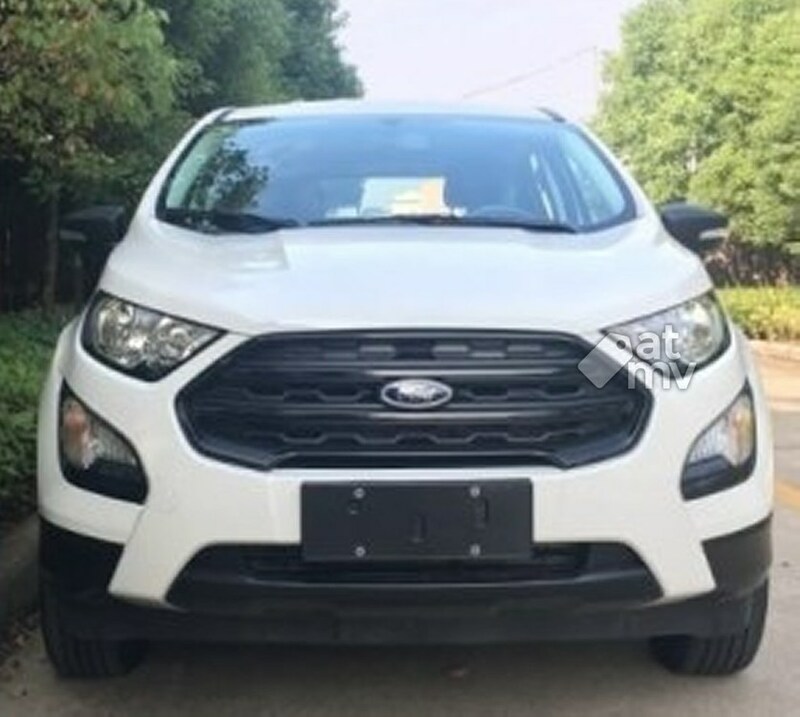 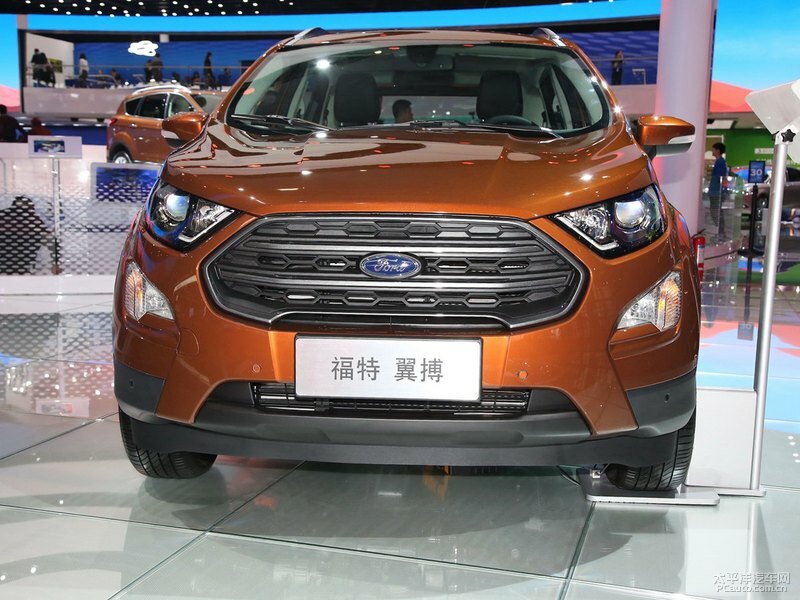 Here is a compter generated rendering of the Ford EcoSport facelift, which according to a report, will be ready for a market launch in the first half of 2016. 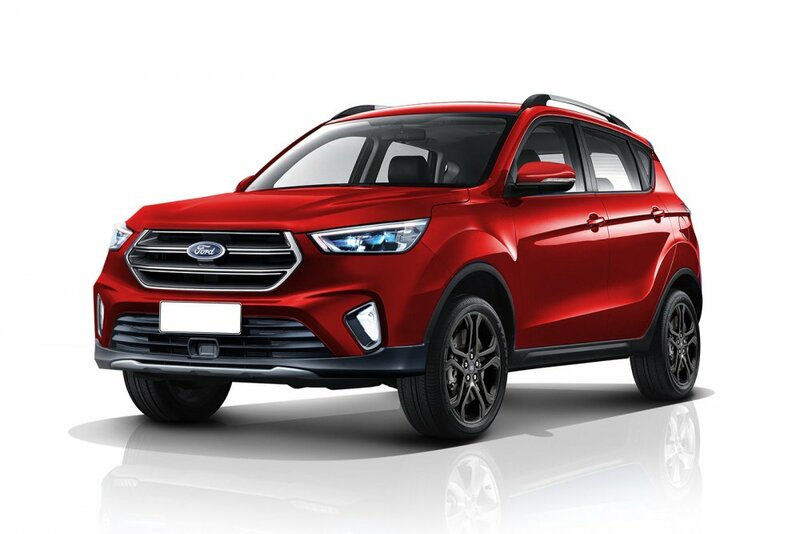 The rendering imagines the compact SUV to borrow its front fascia from the new Ford Edge, with a trapezoidal grille, slim headlight clusters and L-shaped foglight enclosures. 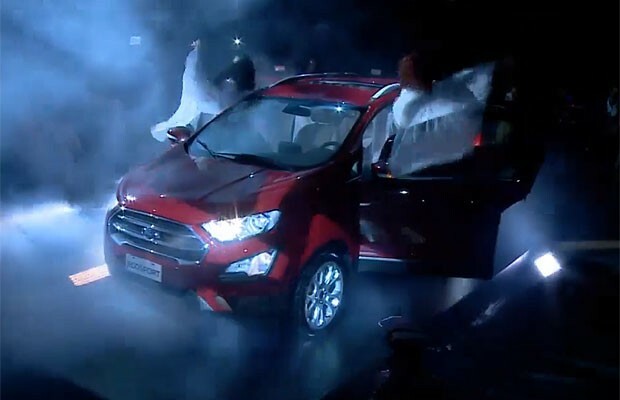 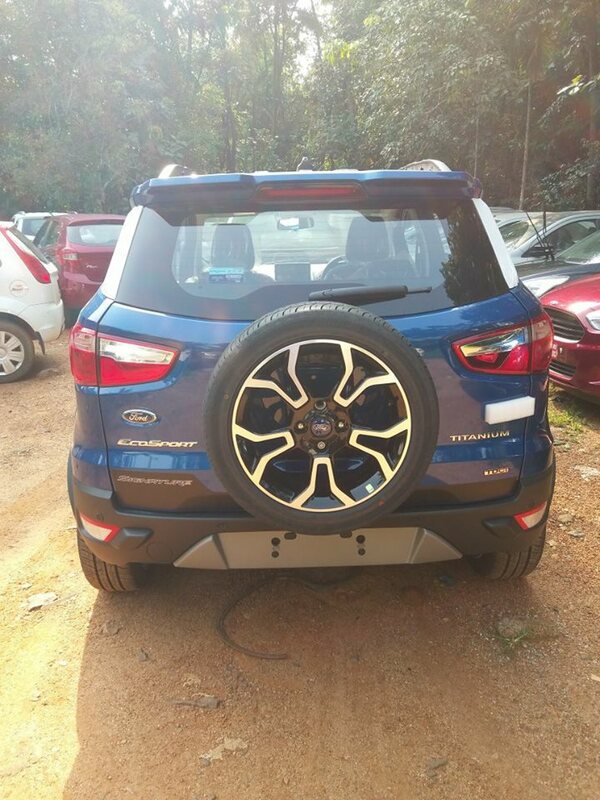 Fantastic....with this shape ford is going very aggressive. 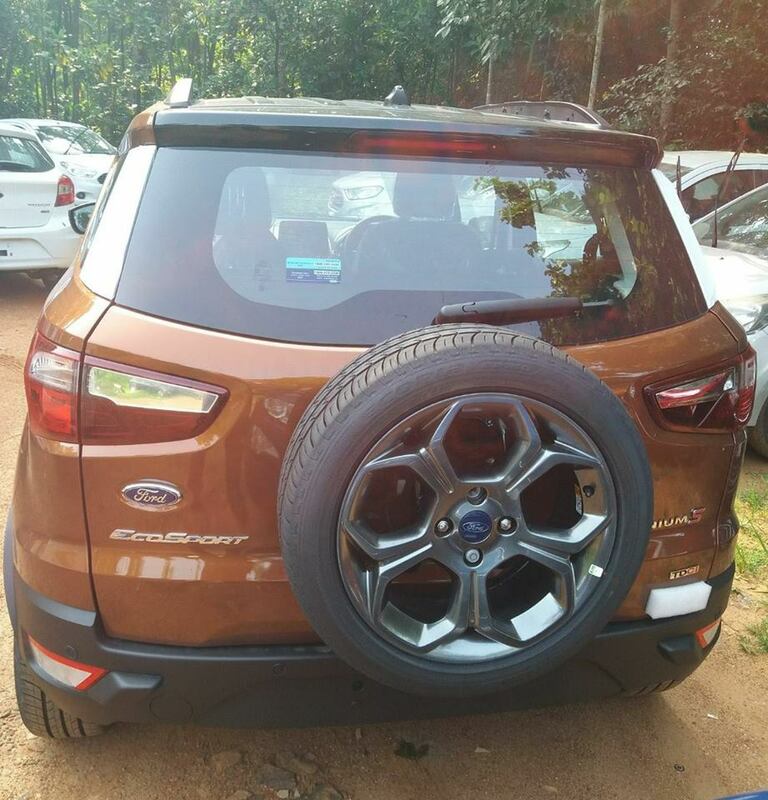 Loved the new fr fascia. 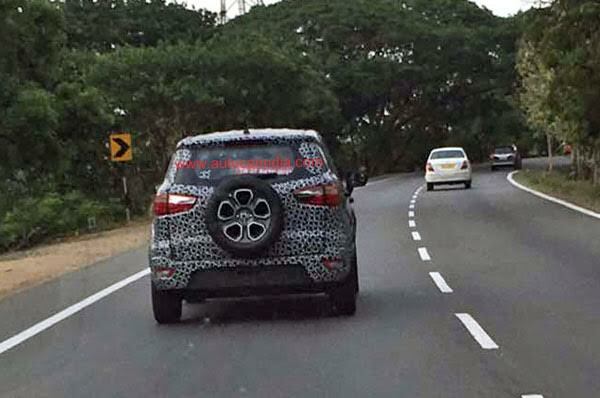 So the first spy pics of the #EcoSport with the tailgate sparewheel are out. 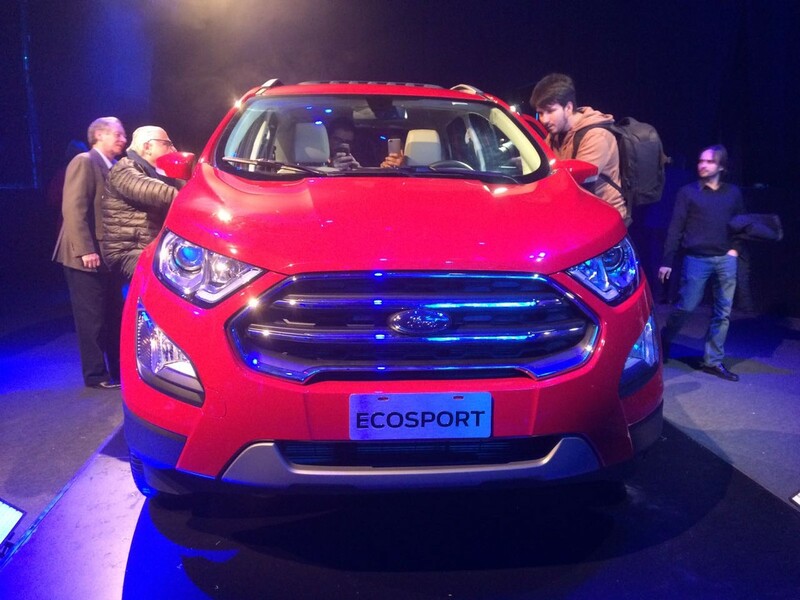 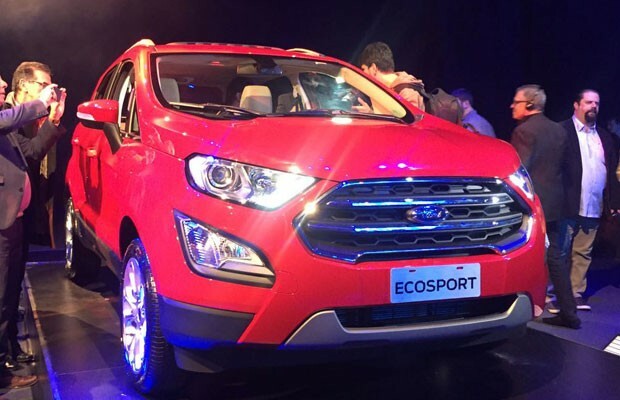 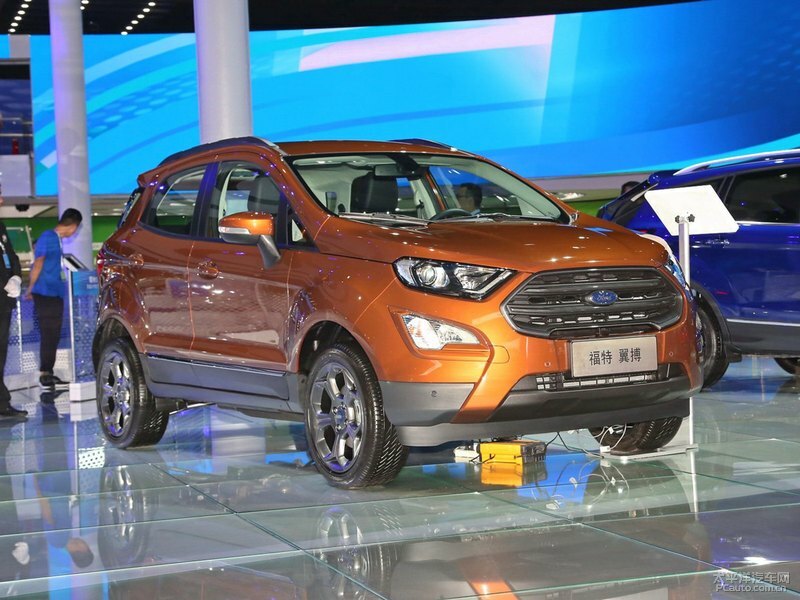 Expect India-spec base EcoSport to look similar to the one in the pics. 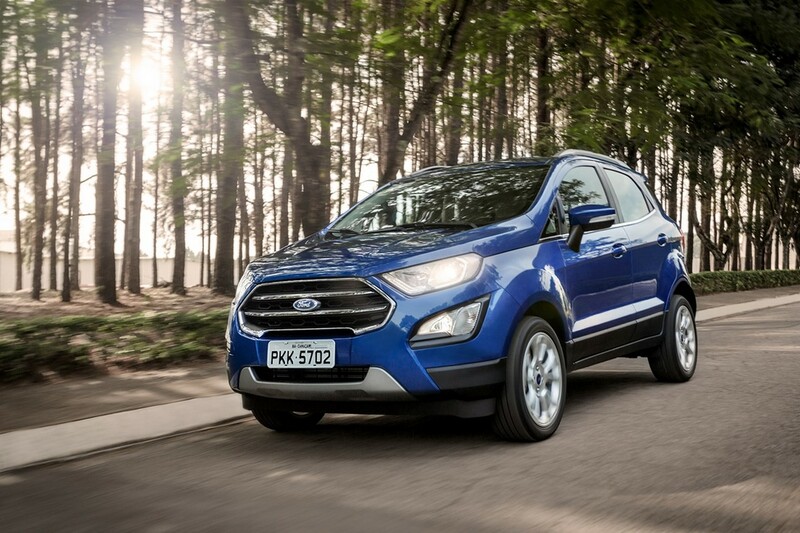 The new design looks more butch and grown-up, but has lost the concept-car look that the Ecosport got so famous for. 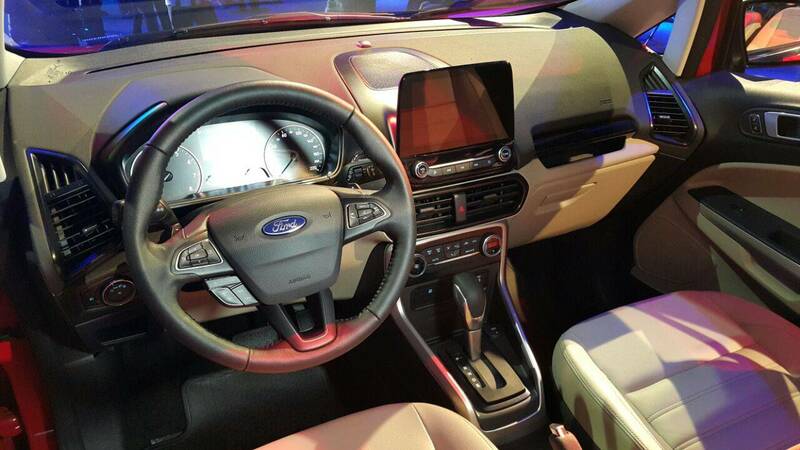 I do not understand why designers chicken out and bring out more sedate versions of their already hot designs! 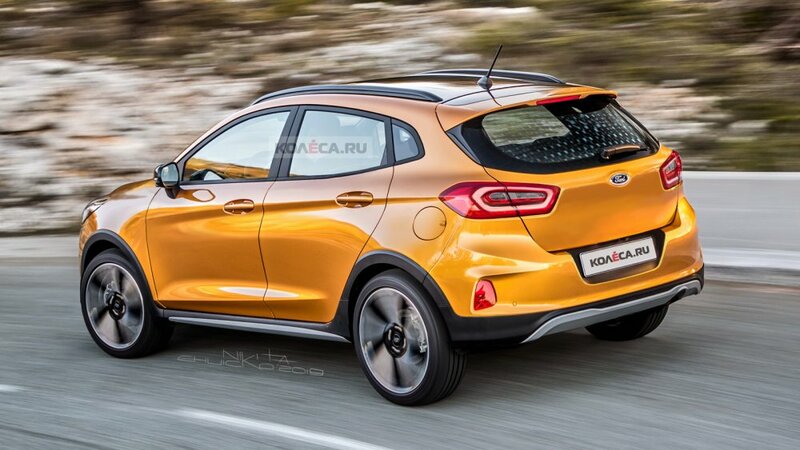 And Ford is not just to blame, even Hyundai seems lost, seeing their new i30, can't believe that they had such a beautiful version earlier. Come on guys, give us more of your hot designs, be liberal with your pen and don't be so afraid of your bosses! 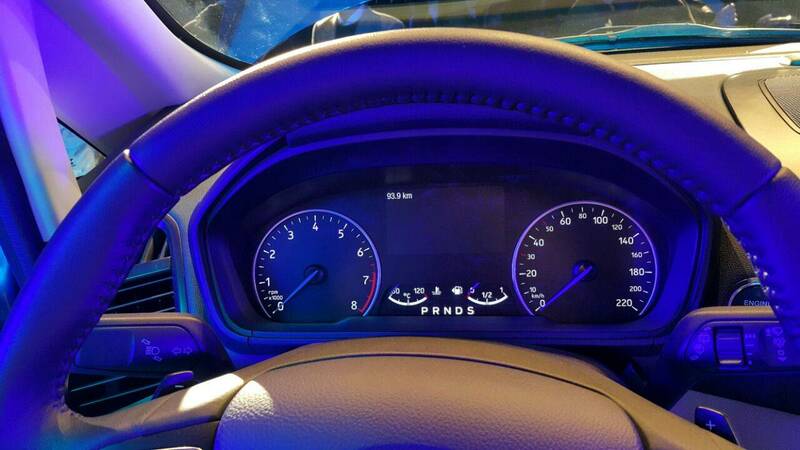 More often than not, it is the designer's pen that does the trick, as can be evident from the Scorpio, XUV500, Kwid, Ciaz, etc. 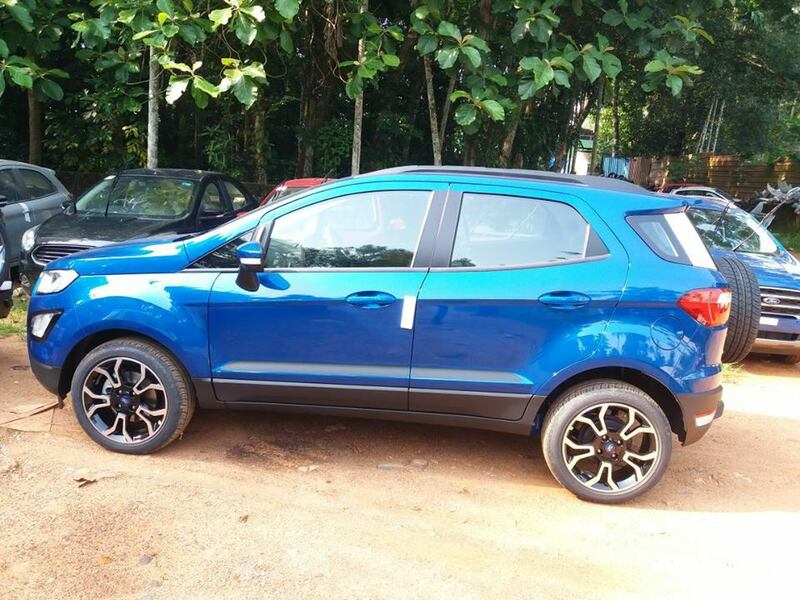 Its a formula that works, so please, do not give us anymore bread boxes like the S-Cross! 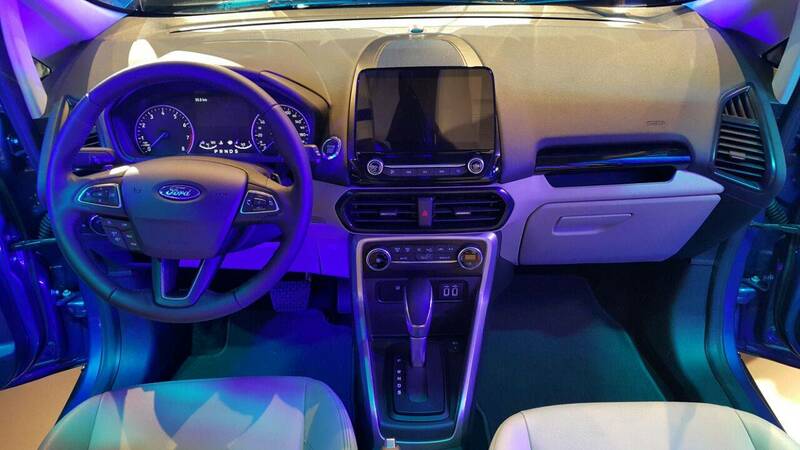 This looks like a great facelift and the interior is also awesome. Eagerly waiting for it to come in Bangalore, India. 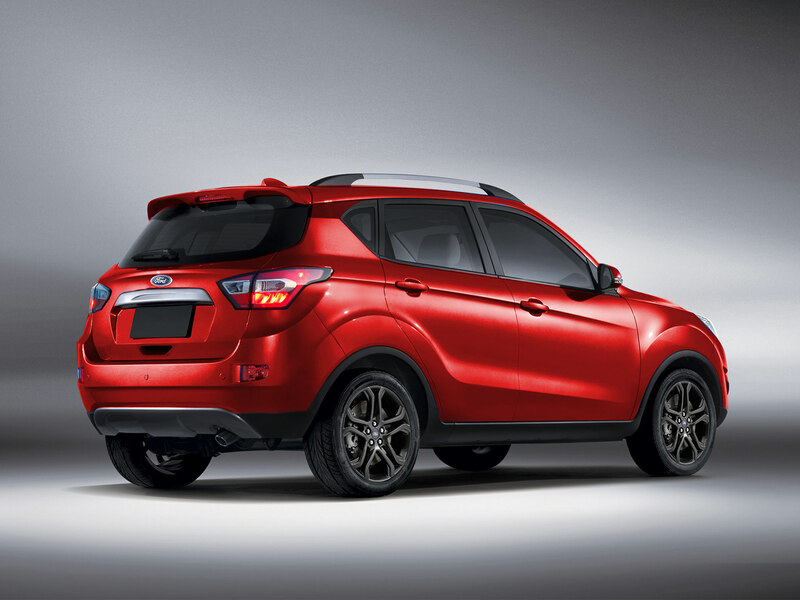 Will postpone my idea of buying a car till this comes. 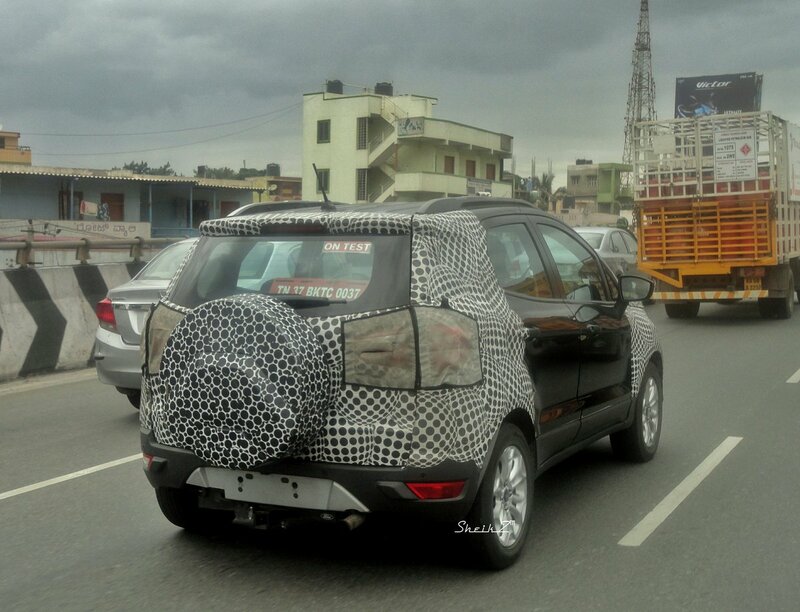 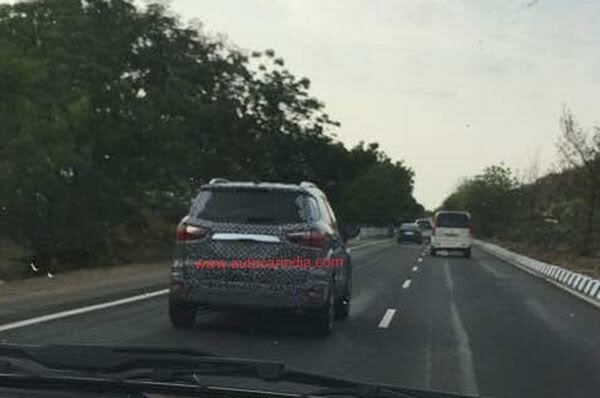 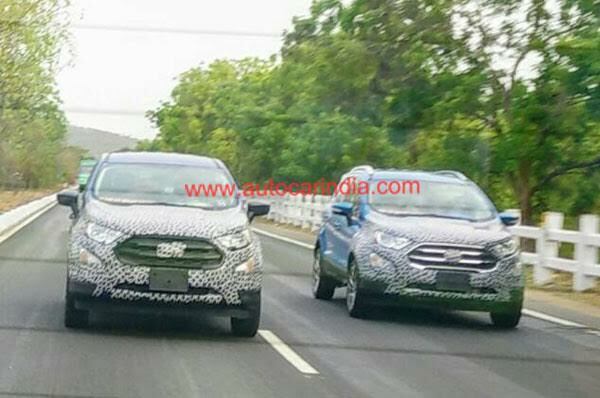 Some more spy shots of the EcoSport facelift testing in India. 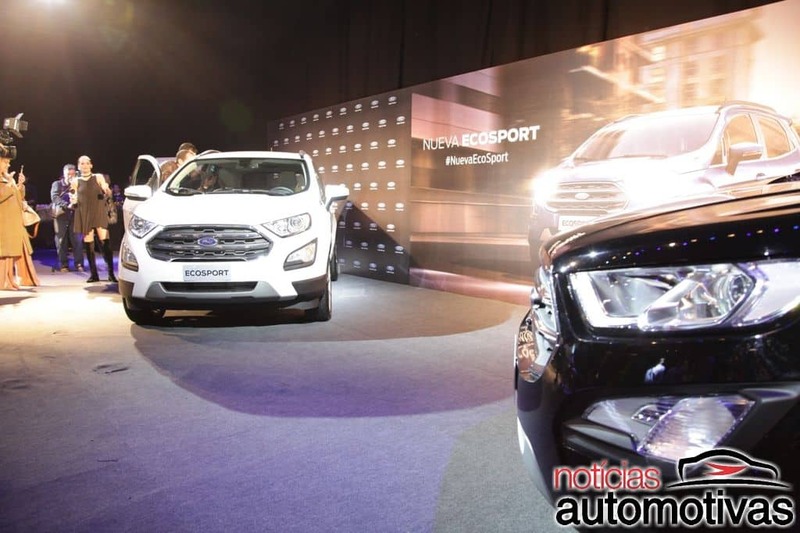 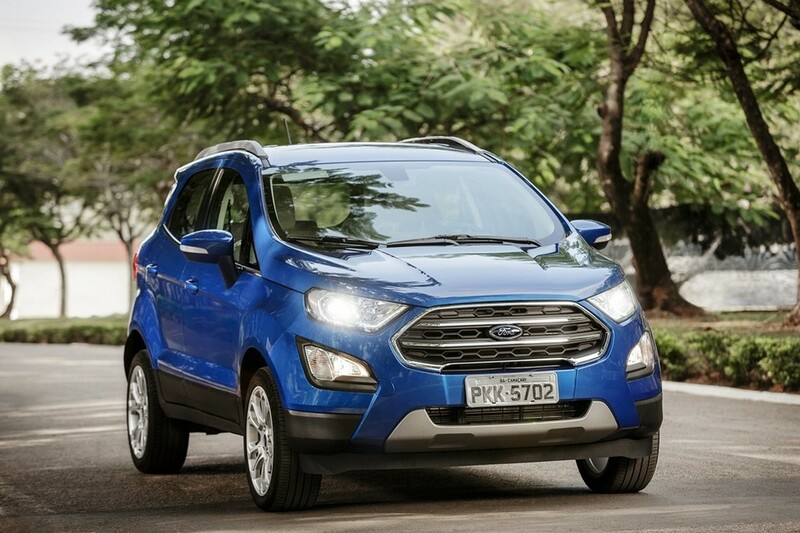 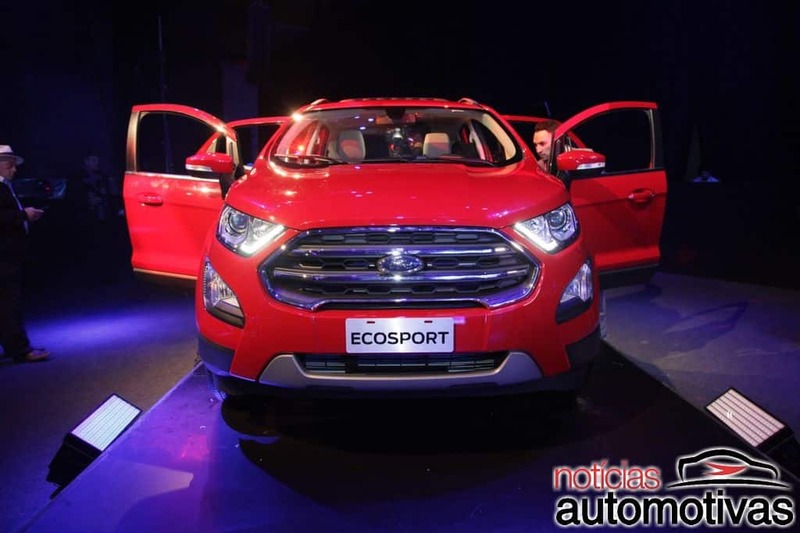 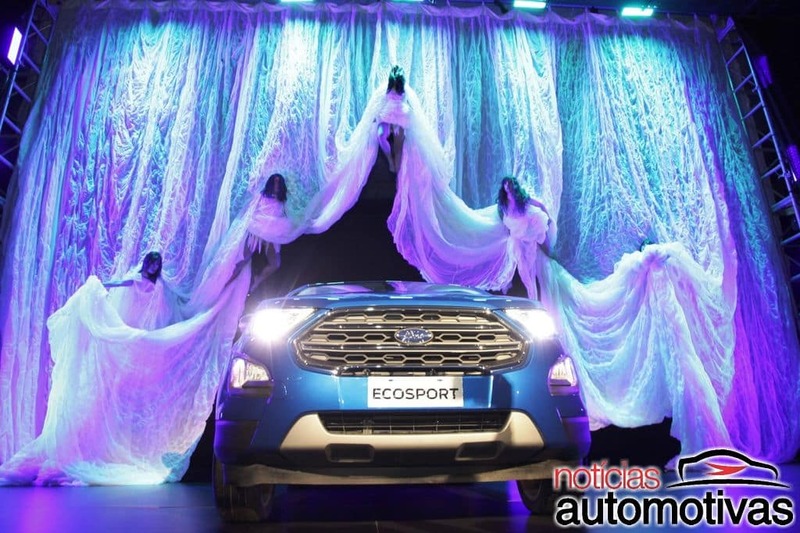 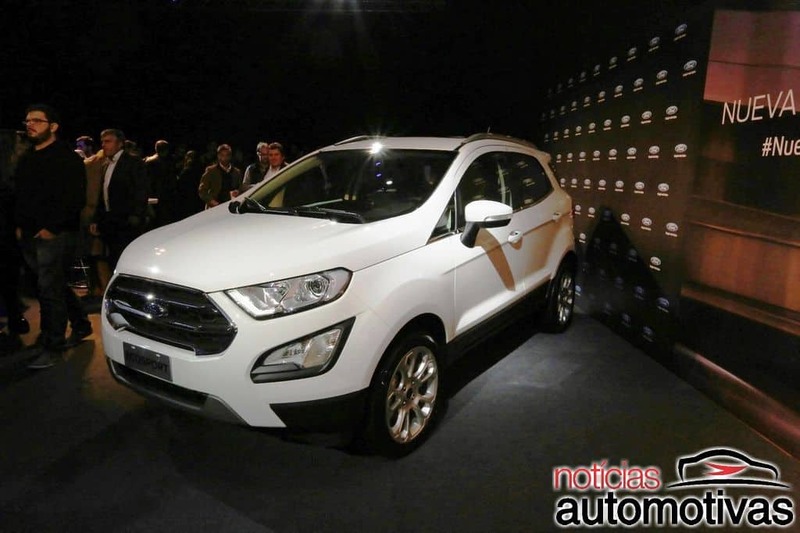 After listing the 2018 Ford EcoSport on its local website last month, Ford Brasil has released new details of the model which is weeks away from the market launch. 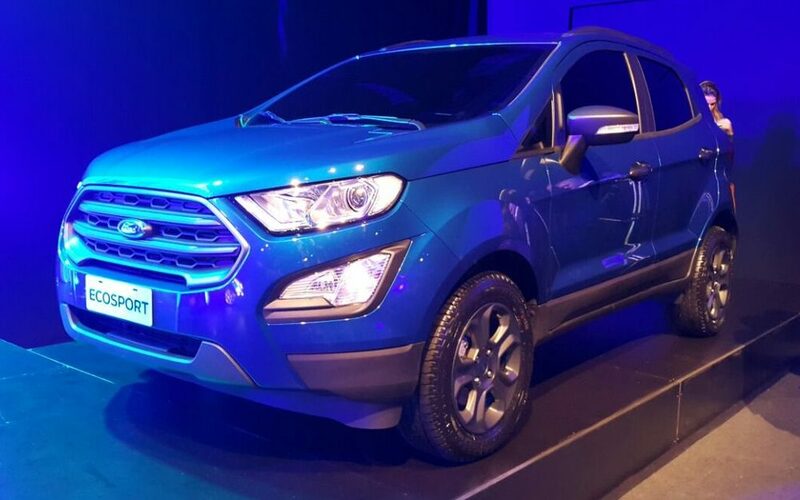 Ford has released details of the 2018 Ford EcoSport in the 2.0 Titanium configuration, which will top the range. 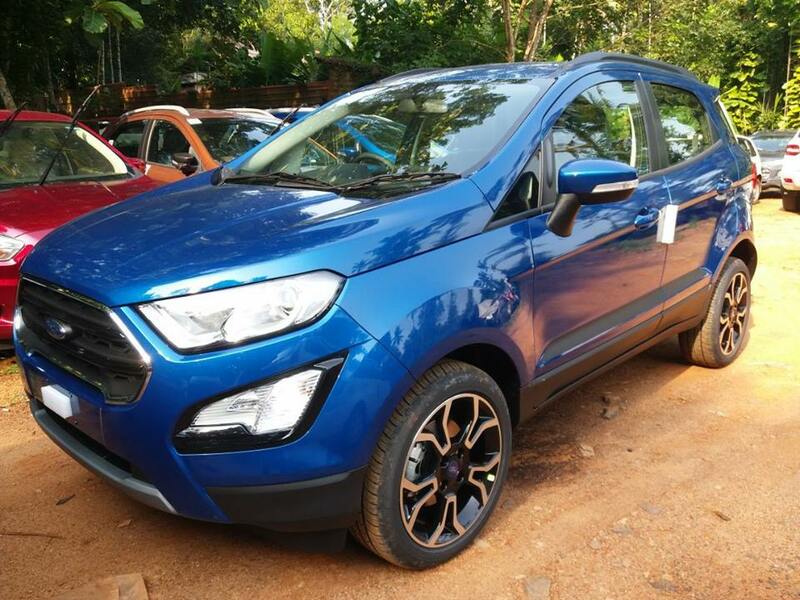 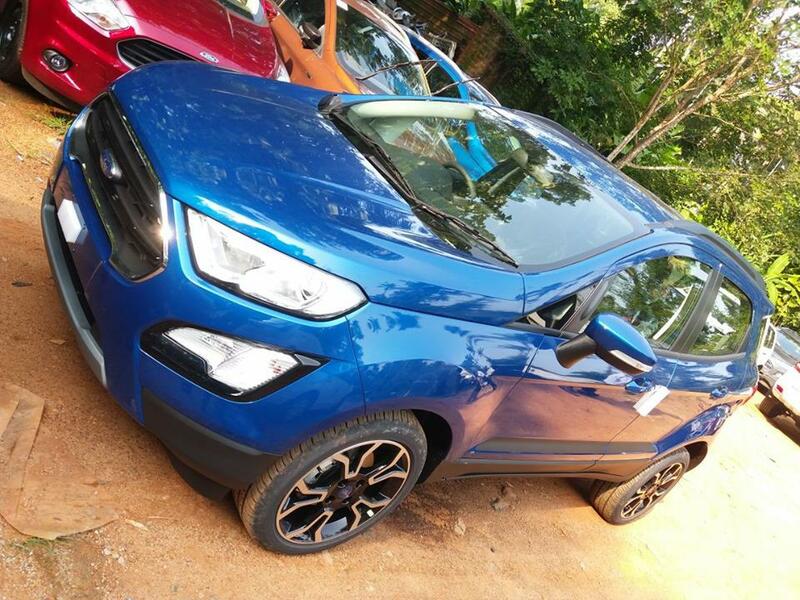 The facelifted EcoSport in this configuration is equipped with features like Xenon headlights with LED daytime running lights, fog lights, 17-inch alloy wheels, chrome trim, roof bars and electric sunroof. 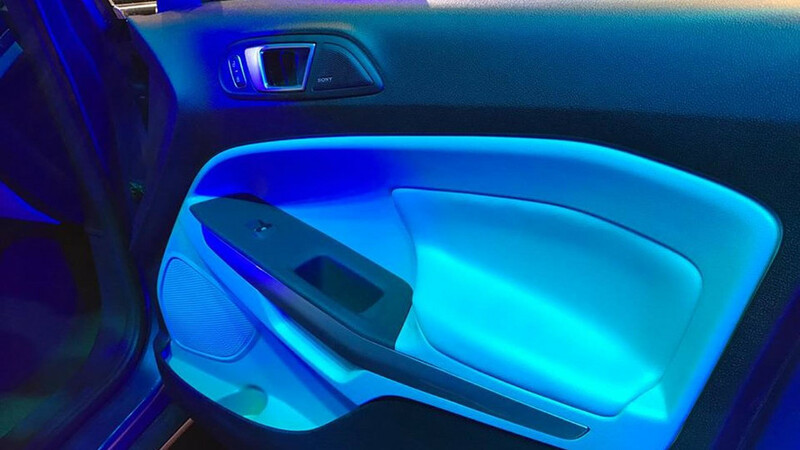 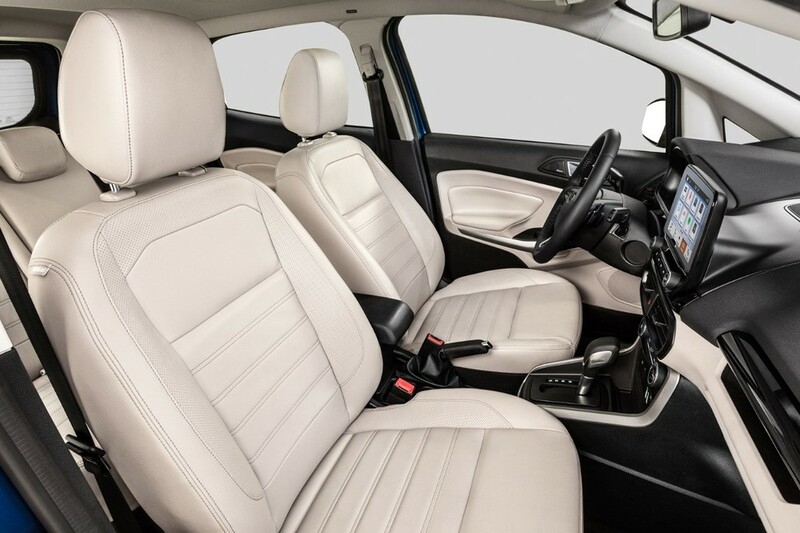 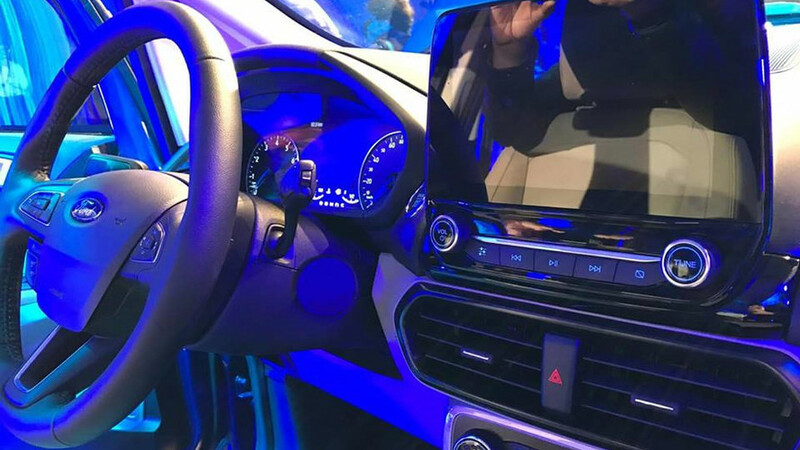 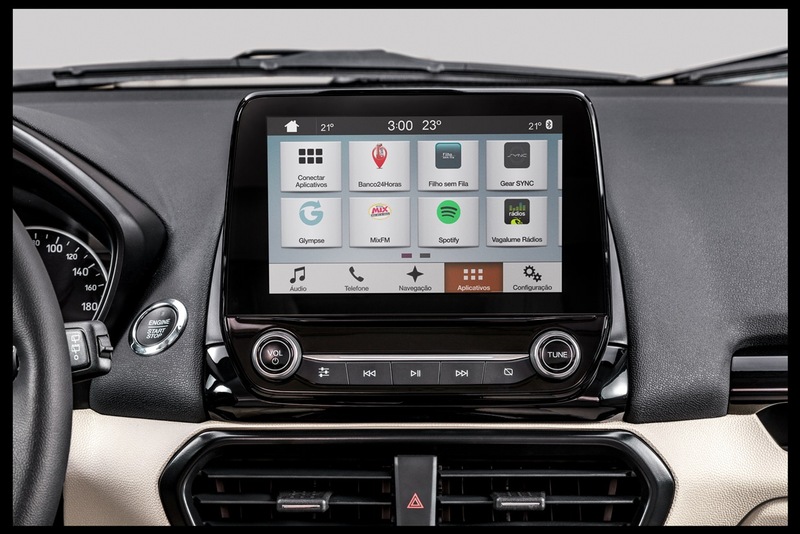 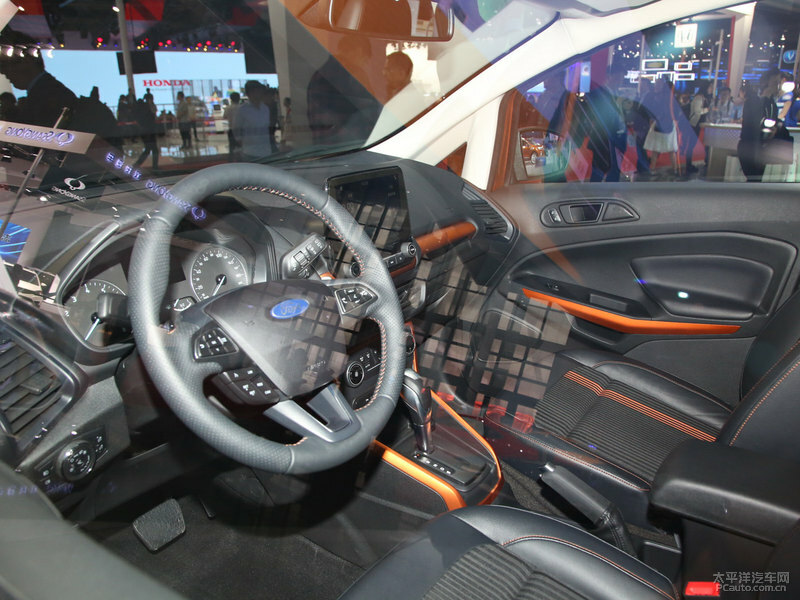 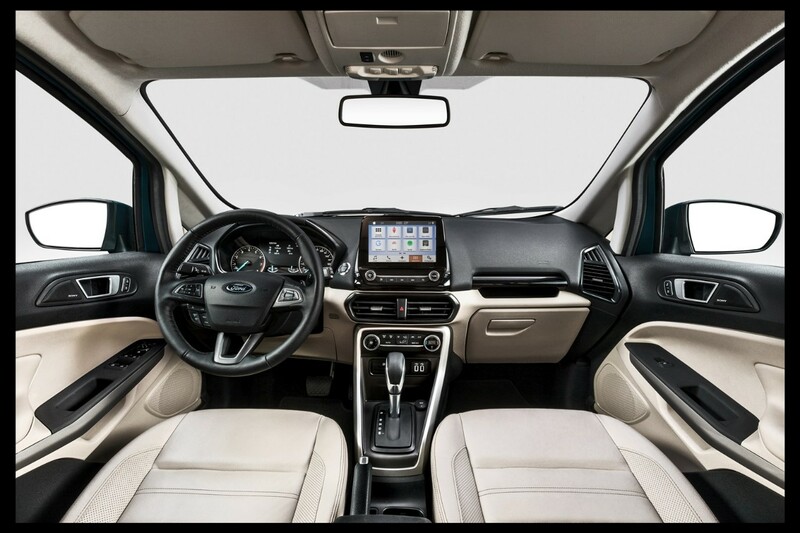 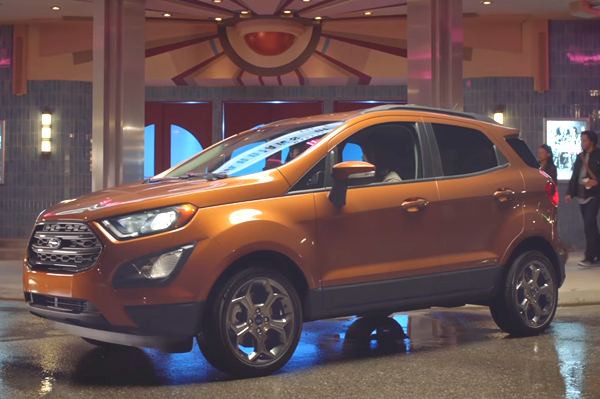 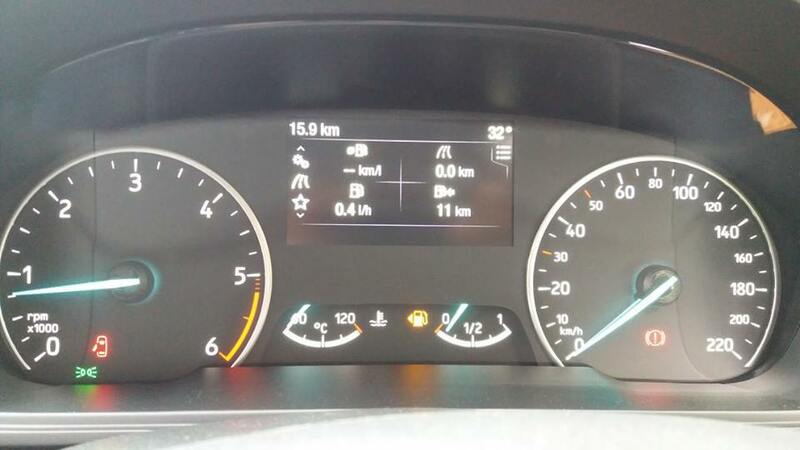 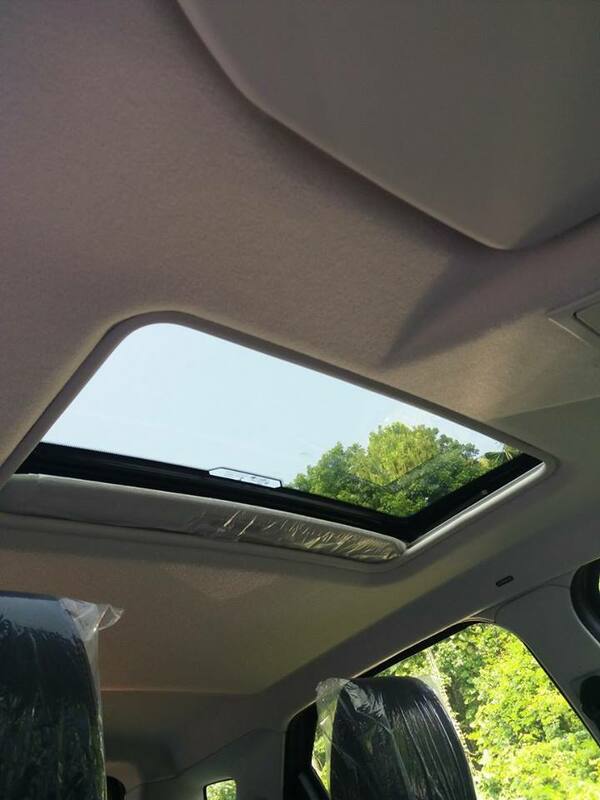 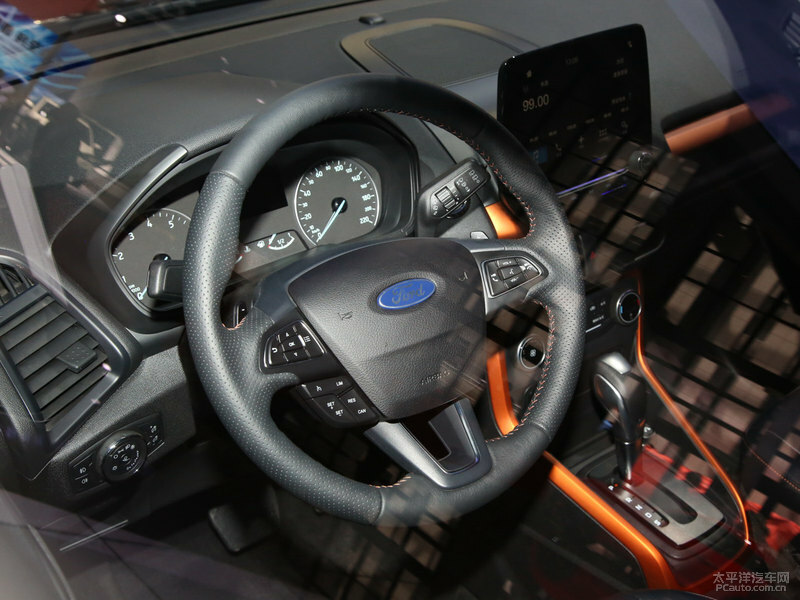 Inside, the 2018 Ford EcoSport in the 2.0 Titanium configuration gets 4.2-inch TFT driver information display, leather steering wheel, leather seats, automatic climate control, engine start button, 8.0-inch SYNC 3 touchscreen infotainment system, 9-speaker Sony sound system and electric windows with one-touch operation. 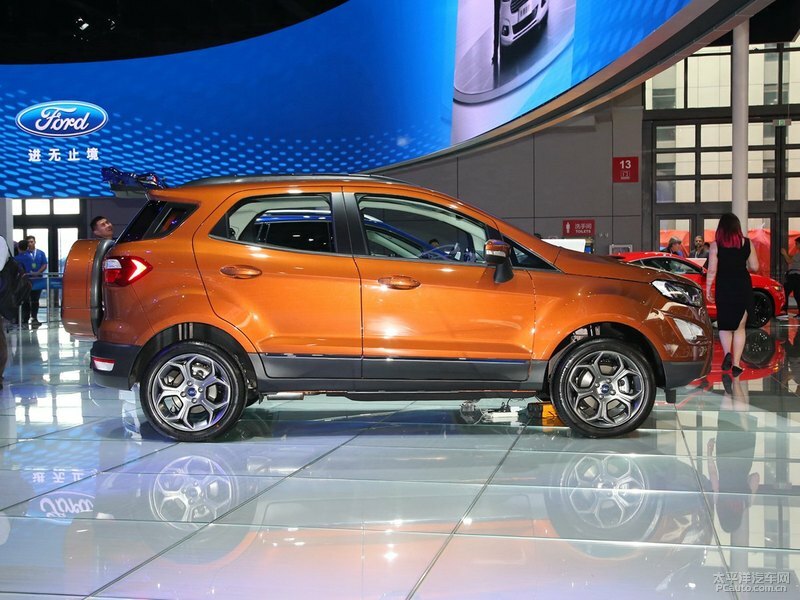 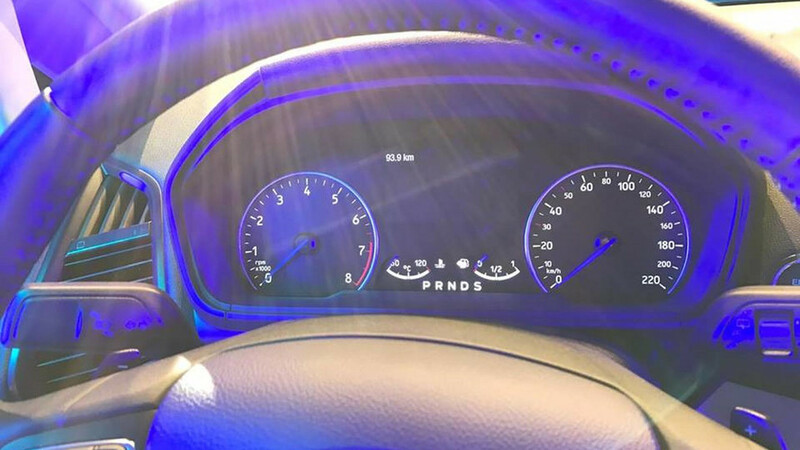 The facelifted model features tyre pressure monitoring system, Blind Spot Information System with cross-traffic alert, seven airbags, rear-view camera, rear parking sensors, stability control and traction control. 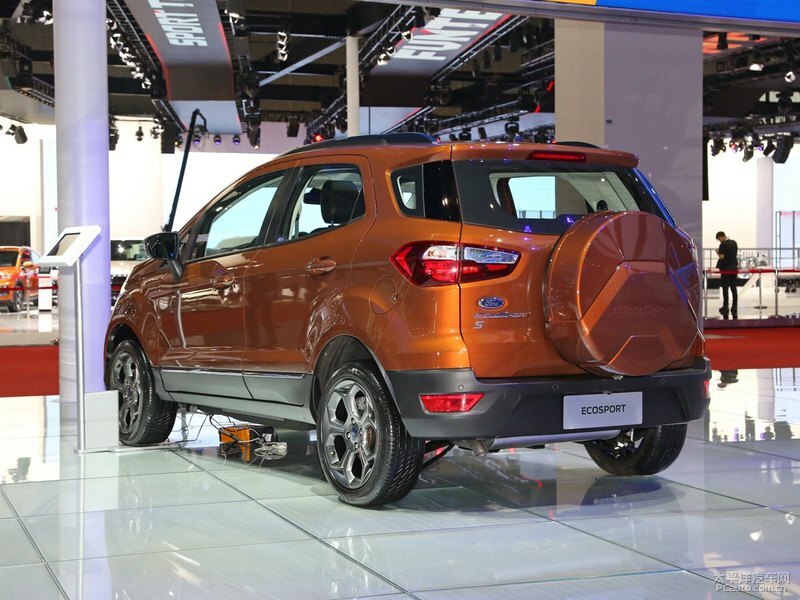 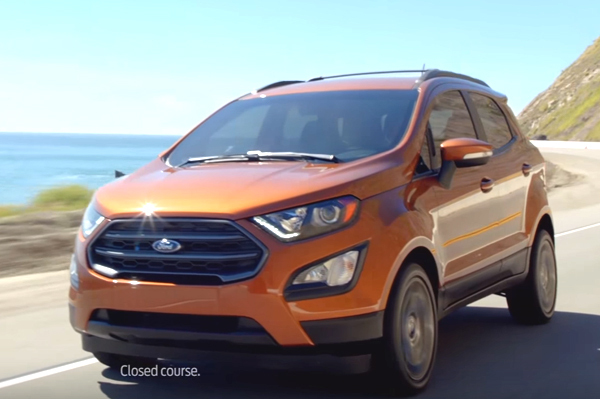 The 2018 Ford EcoSport 2.0 Titanium is powered by the 176 cv (176 hp) 2.0-litre Duratec Direct Flex flex-fuel engine that is paired to a 6-speed automatic transmission with paddle shifters. Ford will also offer the refreshed EcoSport with a new 1.5-litre Flex engine that develops up to 137.2 cv (137.2 hp) and 16.2 kgf.m (158.87 Nm) of torque. 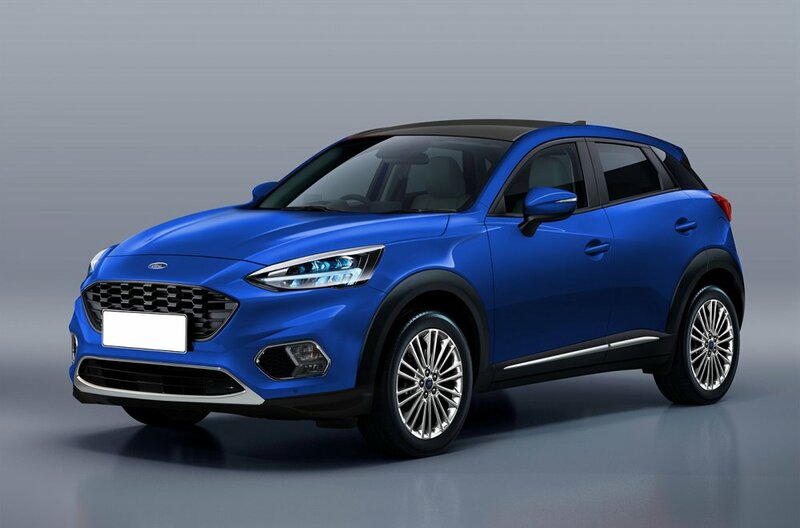 Sales will commence in mid-August 2017. 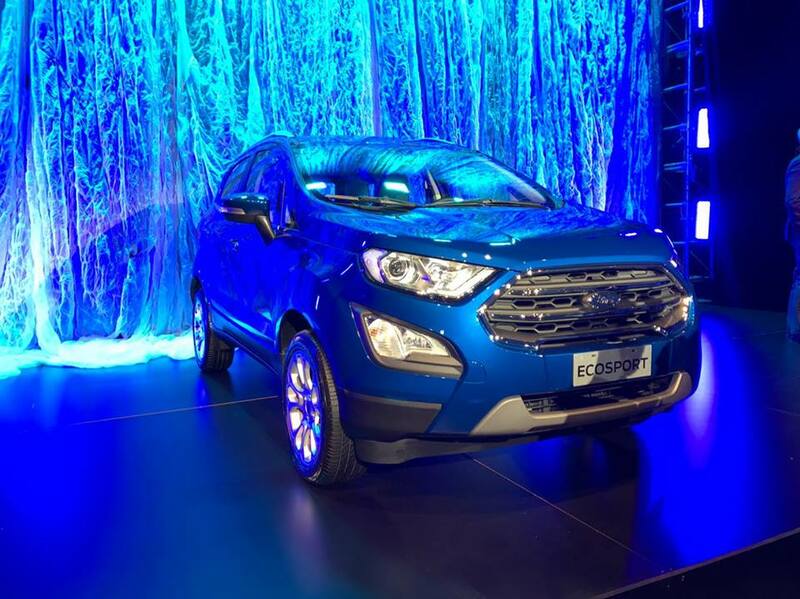 The facelifted compact SUV will be available in five trim levels, two petrol engines and a diesel motor. 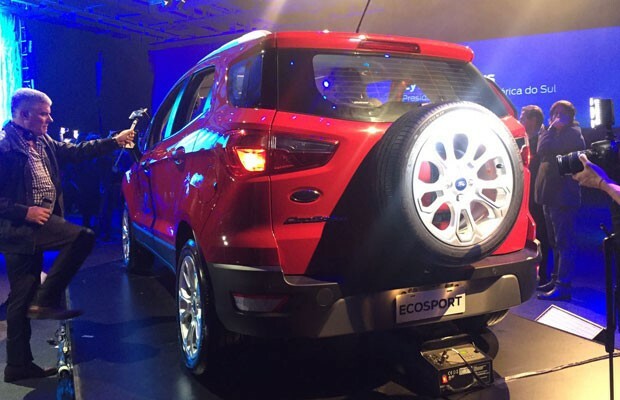 Ford is gearing up to launch its new EcoSport compact SUV on November 9, 2017. 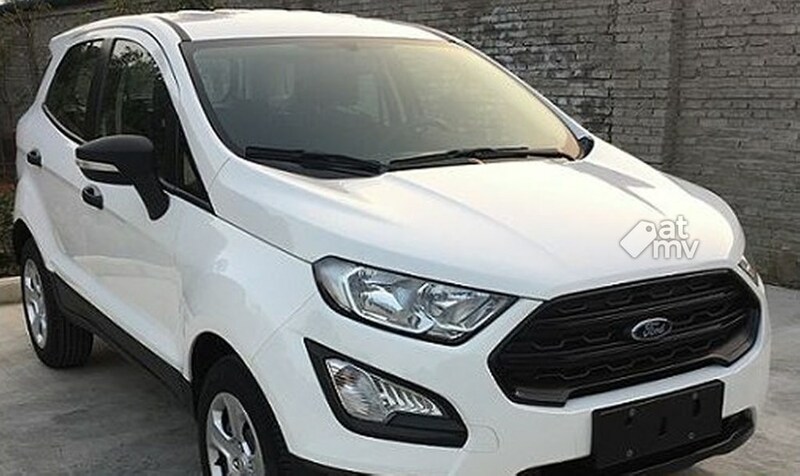 The facelifted model comes with cosmetic changes on the outside and inside and will also be powered by a new 123hp, 1.5-litre petrol motor from the manufacturer’s Dragon series of engines. 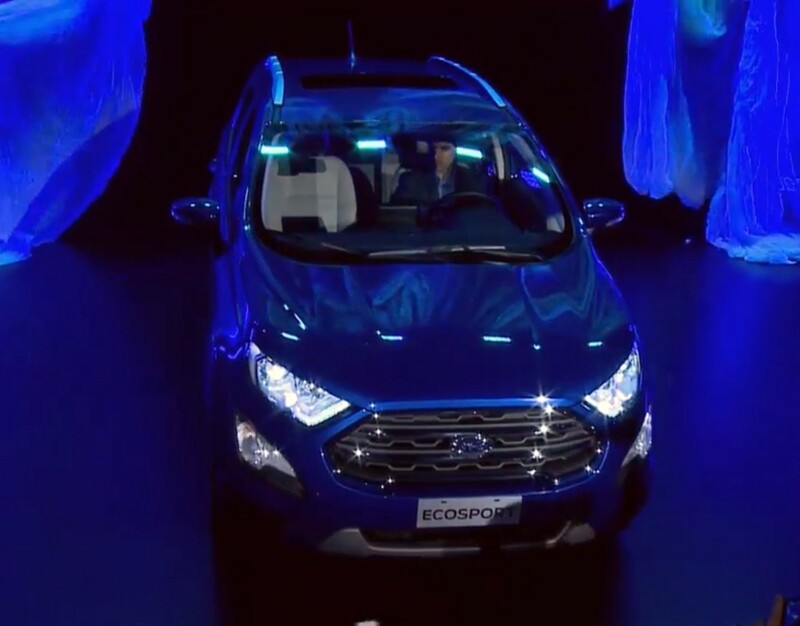 The previously offered 125hp, 1.0-litre turbo-petrol and 100hp, 1.5-litre diesel engines will also be on offer. 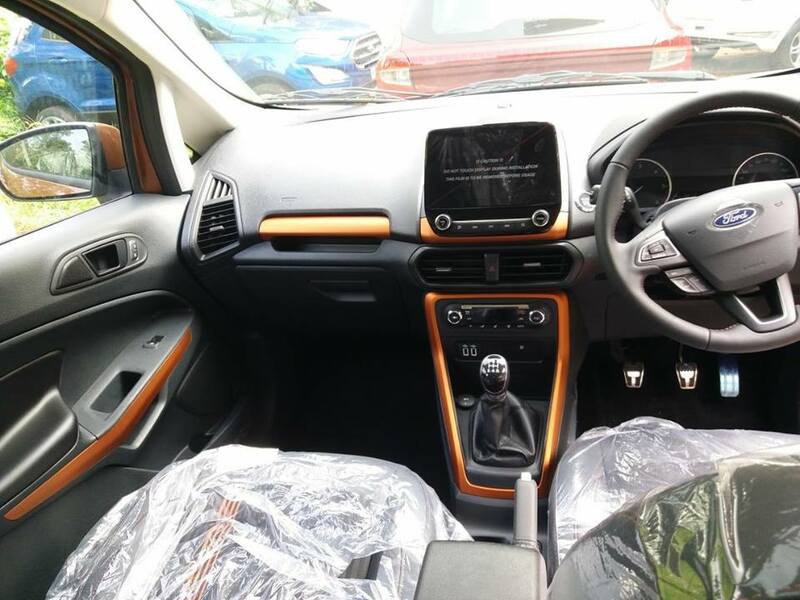 The engines are expected to be mated to a five-speed manual, though a six-speed automatic will be available for the top-spec naturally aspirated petrol-engined trims. 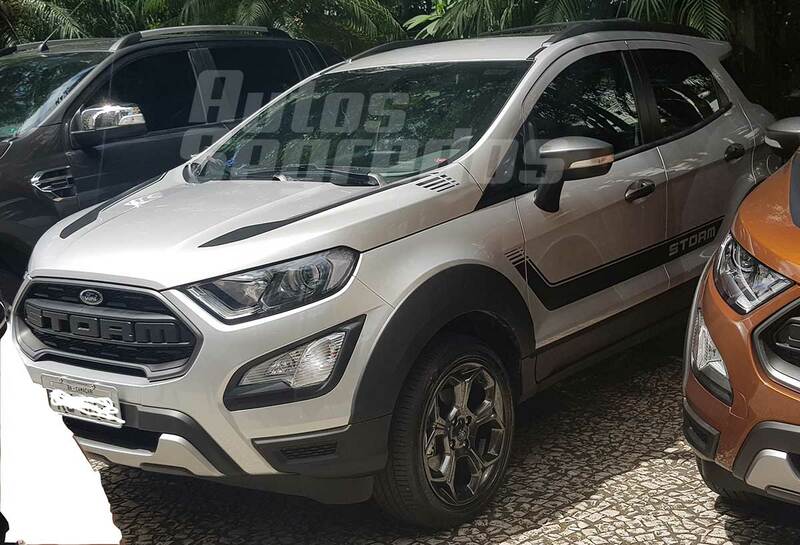 Found some new images of the Titanium S and Signature Edition EcoSport... looks like they've started arriving at dealerships. 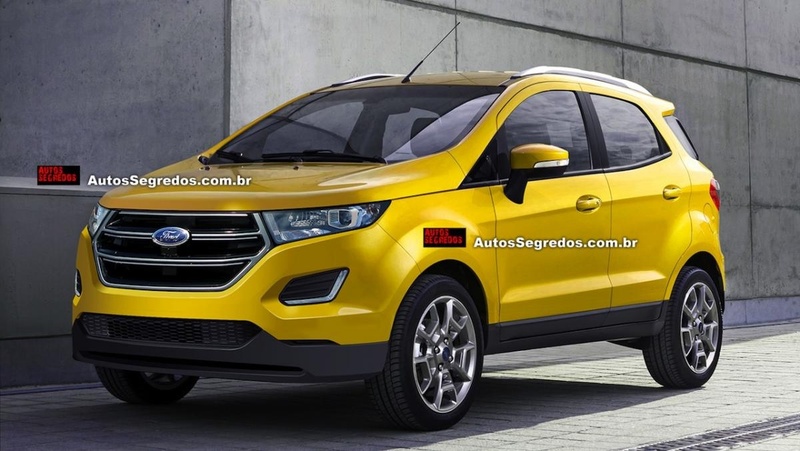 Came across a pretty neat rendering showing what a next-gen EcoSport could look like! What are your thoughts on this? 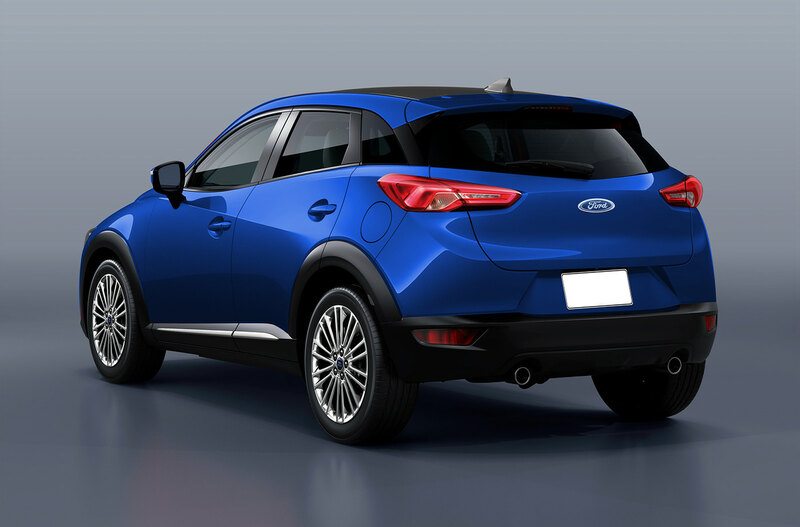 This variant gets cosmetic changes + a four wheel drive system. 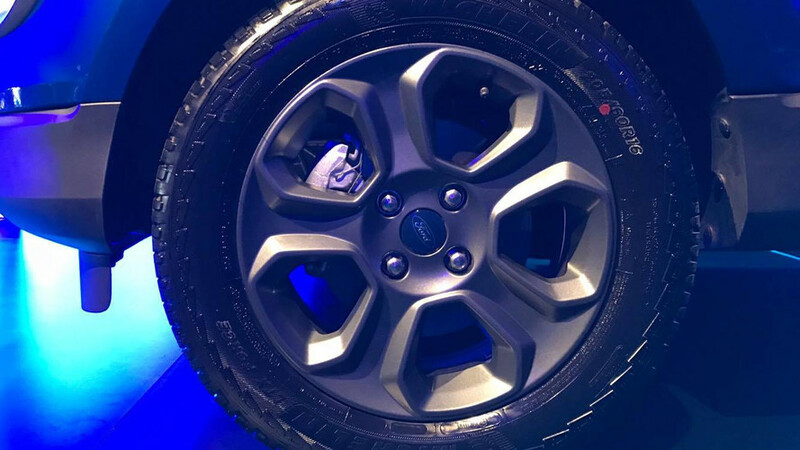 In a bid to increase the model’s off-roading credentials, the suspension set-up has been revised significantly. 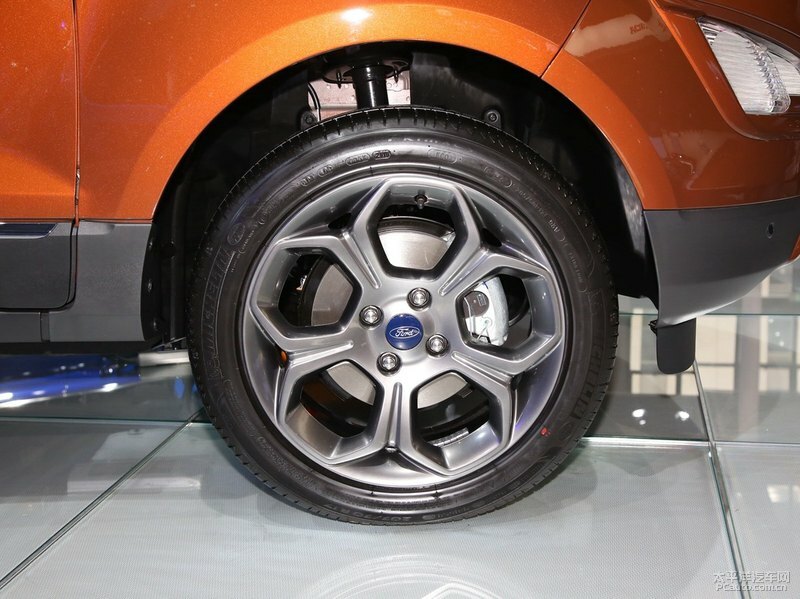 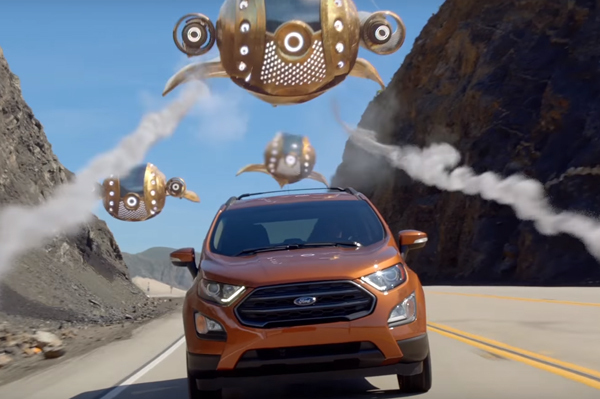 Ford claims that this has resulted in a 15 percent improvement in shock absorption and a 40 percent reduction in steering wheel vibration. Another take on what the next-generation Ford EcoSport could look like! 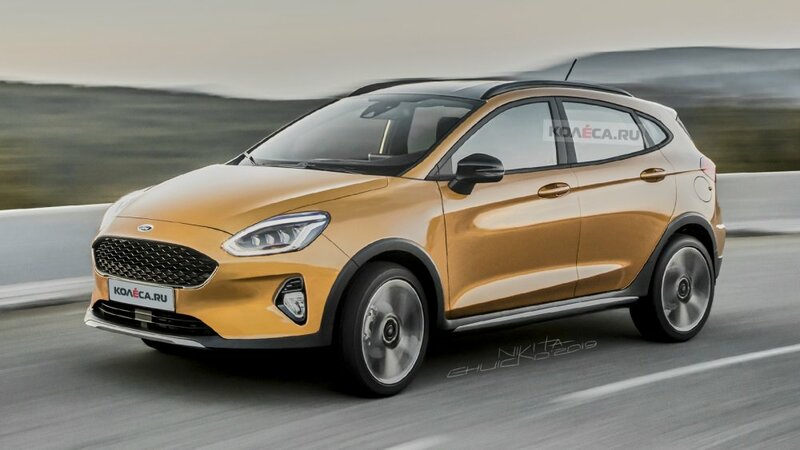 This one is based on the spy pics of the prototype testing abroad, sporting heavily disguised Fiesta hatchback-based bodywork, but with a clear SUV-style raised ride height. 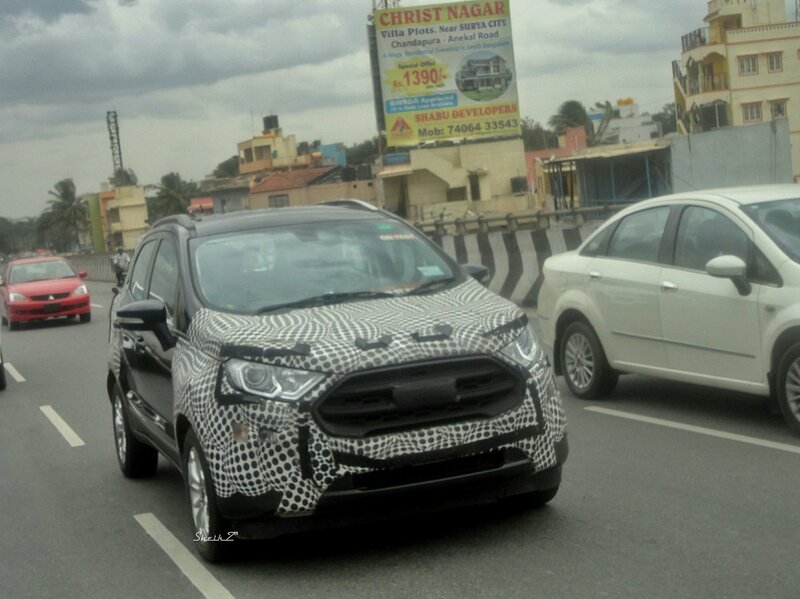 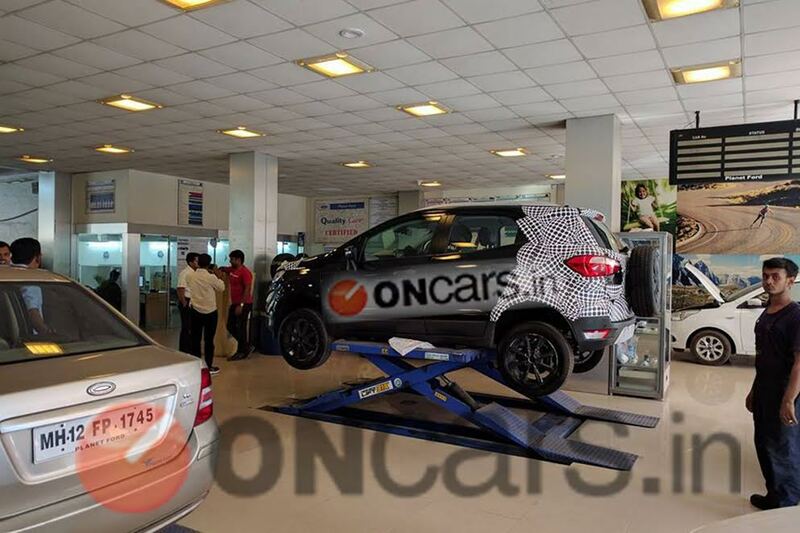 The as-yet-unnamed model, which could continue the EcoSport nameplate or take on a new identity and will serve as a replacement for the ageing EcoSport as the smallest model in Ford’s SUV range. 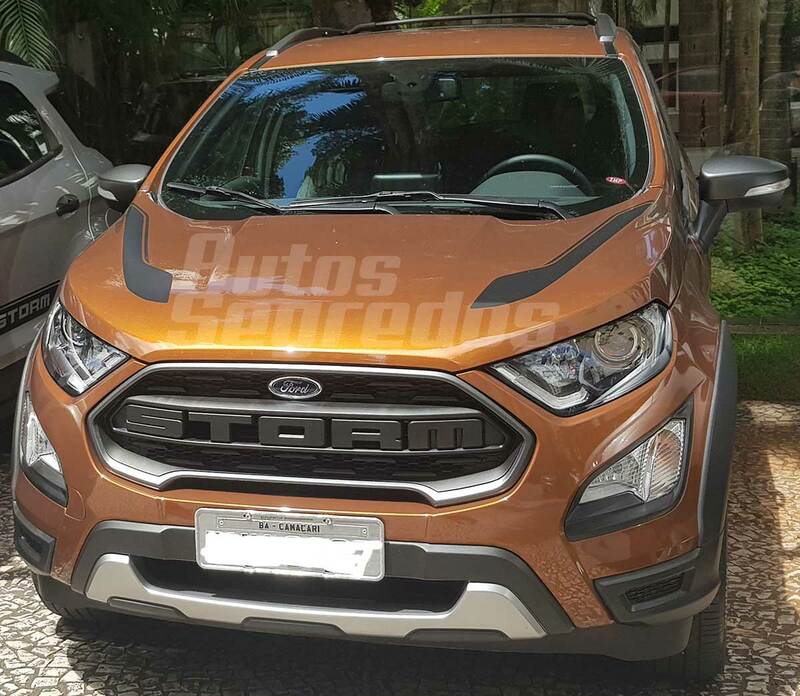 Here is another render of the next-generation of the Ford EcoSport compact SUV. What do you guys think of the design shown in the render?